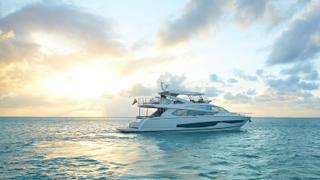 The first Pearl 80 motor yacht has been spotted off the coast of Miami undergoing sea trials. Launched earlier this year and given a public debut at the 2017 Fort Lauderdale International Boat Show, the Pearl 80 is the largest yacht that the British yard has launched to date, measuring 23.9 metres LOA. Accommodation on board the Pearl 80 is for up to eight guests split across four cabins, including a full-beam master suite, situated amidships. Two further doubles and a twin complete the guest layout, while the crew quarters back aft allows for a staff of two people. The spacious interior places a strong emphasis on modern styling with Kelly Hoppen developing the décor for the Pearl 80. Out on deck, guests can choose between the foredeck seating area or the superyacht sundeck, complete with wetbar, spa pool, sunloungers, electric barbecue and a retractable bimini. The hydraulic bathing platform provides easy access to the water and can be used to store a Jet Ski as well as a tender. Pearl Motor Yachts has fitted out its flagship to a high standard, with reverse-cycle air conditioning, LED televisions in all guest cabins and a Fusion stereo system that can pipe music throughout the yacht. Vital statistics include a 6.01 metre beam and a maximum draught of just 1.6 metres — ideal for exploring the shallow cruising grounds around Miami. Power comes from a pair of 1,800hp MAN V12 engines for a top speed of 35 knots. 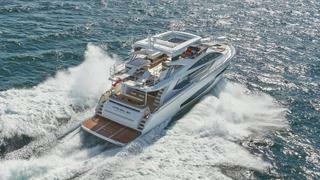 When trimmed back to her cruising speed of 25 knots, the Pearl 80 has an estimated range of 350 nautical miles.